ORA’s all new Optiwave™ technology takes intraoperative wavefront aberrometry to a new level of precision providing surgeons a higher level of confidence. The use of the ORA intraoperative aberrometer enables accurate, real-time intraocular lens (IOL) calculations, creation, and enhancements, of Limbal Relaxing Incisions (LRIs). ORA measurements are easily incorporated into the surgical routine, adding minimal time. Patient selection is determined by the surgeon and in today’s modern refractive cataract surgery, most patients are candidates for this technology. The ORA System™ is clinically proven to increase accuracy and improve outcomes. It provides intraoperative refractive information and enables real-time surgical course correction. 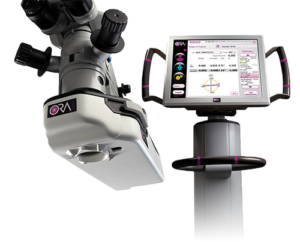 The ORA system is compatible with and attaches directly to existing surgical microscopes, and connects live to WaveTec servers to capture every procedure and push software upgrades.